The other day I picked my son up from from school. As usual, I started talking about something I learned that day and as usual, when I think I might have used a word or started a topic my son may not know about, I ask, ‘are you familiar with that word/topic?’ And on cue he says, ‘Yes.’ When I say, ‘then tell me what you know’ he says, ‘well I don’t really remember. Can you explain, again?’ Such is the life of a child. It’s not a good habit at 13, and it is especially limiting if you are an attorney. The truth is lawyers tend to be rather impressed with how much they know because non-lawyers are generally impressed with what they believe attorneys know. And this can really box lawyers in. Yet, one of the most profound ways to transform yourself and transform your relationship with clients and others in your life is to act like you don’t have all the answers. Let’s just talk about every day life. When you say ‘I know’ to anyone who may be trying to educate you or explain something to you, you are effectively battening down the hatches on getting a much deeper understanding on a topic, or a new perspective on an issue, or even getting help in your education or your business if you are not succeeding on your own. By keeping an open mind to new ideas, new concepts, new perspectives, other people’s experiences they are willing to share, you free yourself from being the dreaded ‘know-it-all’ and become someone who wants to perpetually learn and deeply understand and incorporate that deeper knowledge into how you live your life. And this includes your work life. It’s tough when you are a lawyer, however. Especially a new lawyer who is so fearful of letting on there is something you may not know or fully understand. You want a mentor, but there is an image we are bucking up against, that of someone who knows everything because you are positioned as an adviser. Lawyering is no different than your everyday life as you have to keep an open mind, stay curious and keep learning. If you do, you will have greater success, make fewer mistakes, and continue a professional career which involves life-long learning instead of repeating limited knowledge year after year. And we often need to hear things several times before we actually ‘get it’. But once we do understand it, that’s when we become it. 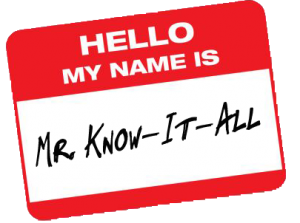 Are you a practicing ‘know-it-all’? Do you have a favorite line which invites others to share their knowledge? This entry was posted in Client Relations, Solo & Small Firm Practice, Subjective Opinions. Bookmark the permalink. ← I Can’t Believe My Former Client Posted That! MyCase is the all-in-one web-based practice management software designed for the modern law firm. I agree that it is prudent and logical to admit that you don’t know the answers when you truly are not certain of the answers. It can backfire to admit you don’t know everything, especially to clients who expect instant answers. I was once told by a former municipal client that one of the reasons I was being replaced was because I could not answer questions on the spot but frequently said I needed to research the issue to determine the best legal avenue. Their loss, of course. Yes, it is an art form. You have to know when and with whom. However, with complex matters, a client doesn’t understand that an attorney shooting from the hip is the last thing they want! Thanks for joining the conversation.